Putting an end in Chonae to the river's flood. On the sixth of the month Michael funneled the flow of the river. Michael, the great and chief commander of God's bodiless hosts, both before the incarnation and after, showed compassion and solicitude toward the race of man [Josh. 5:13-15; Dan. 10: 13, 12: 1; Jude 1:9; Rev. 12:71]. He bestowed many benefits on earth before the coming of Christ, and afterward he showed even greater care and love toward the Christians. Colossae was an ancient city of southern Phrygia, the extensive western part of Anatolia, overhanging the Lykos (a tributary of the Meander) on the upper part of its course. The city was some ten miles from Laodikeia and thirteen from Hieropolis [Col. 2:1, 4:13, 15,16; Rev. 1: 11]. 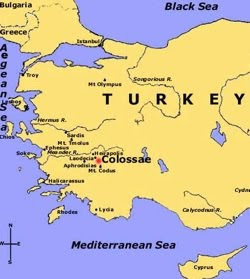 The three cities formed a single sphere of missionary labor for Epaphras, an inhabitant of Colossae [Col. 1:7, 4:12, 13]. The city originally lay on the main trade route from Ephesus to the Euphrates and the East, at the junction of the highways to Sardis and Pergamon. Colossae was catastrophically weakened in the 7th and 8th centuries with the gradual breakdown of Byzantine power in Asia Minor, leaving the Colossians exposed to Saraceen raiders. The remaining population moved to Chonae (the modern Chonas), a fortress about three miles further south, with an impregnable castle upon the steep slope of Mount Cadmus (summit 8,013 ft.). Final destruction came in the 12th century with the Turkish invasion. The site is presently unoccupied. In one of the villages of Lydia, Saint John the Theologian met with the Apostle Philip and his sister, Saint Mariamne. They departed with him into the land of Phrygia. There they entered into a city, also known as Hieropolis (Pamukkale), on the borders between Phrygia and Lydia, and they preached Christ. This city, famous for its hot spring and deposits of calcium, was the home of countless idols, which were worshipped by all the people; and besides these false gods they also had a viper for which they had constructed a special temple. They brought food to this viper and offered up manifold and divers sacrifices thereto. And the foolish people also worshipped other vipers and serpents. 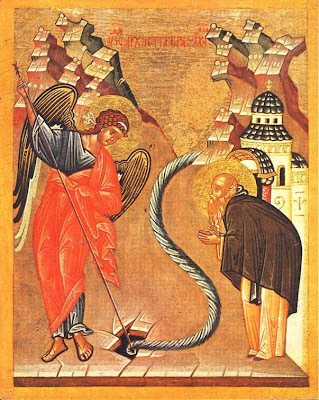 Saint Philip and his sister first armed themselves against the viper with prayer, wherein they were aided by Saint John the Theologian, who was with them at the time. And together they slew the viper with prayer, as with a spear, putting it to death through the power of Christ. At length, the pagans crucified Saint Philip, and he received the crown of martyrdom. Christ shook Hieropolis to its foundations with a devastating quake. The profane people of Hieropolis, seized with great terror, repented of their impiety. Falling before the feet of the Apostle John, they begged mercy. He baptized them in the name of the Father and of the Son and of the Holy Spirit, and taught them the truth. The substantial ruins of the Church of Saint Philip, on the site of his martyrdom, may still be seen today in Hieropolis. Thereafter, Saint John determined to go away. He came to a place called Herotopon, which lies nearby Hieropolis, where he brought the pagan Greeks to the knowledge of the true God. In that place, the divine Elder John prophesied that at a later time there would spring forth there a great abundance of holy water in honor of the Archangel Michael, who would perform awesome wonders and miracles. There was a certain rich Greek pagan in the city of Laodikeia. He had an only daughter who suffered with speechlessness and was dumb from her mother's womb. The father experienced great sorrow concerning this, and would gladly have given her his soul just to behold her speak. One day, he beheld a favorable vision. 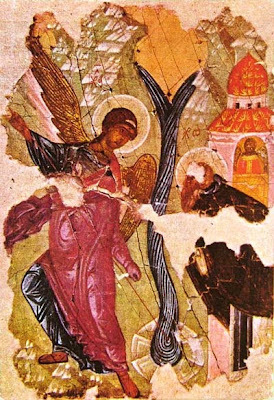 In his sleep he observed a certain man telling him to go to the holy waters (Agiasma) of the Archangel Michael; for he would not return embittered. Indeed, he was told that his daughter would receive healing, and that he himself would gain the salvation of his soul. Now he beheld this vision not because he was found worthy (since he was benighted utterly with the impiety of idolatry), but rather because God, Who wishes to save all men and have them come to a full knowledge of the truth, dispensed in His economy this vision, so that through the working of the miracle the Greek pagan would be converted and others, too, would be strengthened in godliness. When that Greek pagan awoke, with fear and trembling, he took along his daughter and went to the holy waters of the archangel. Having arrived, he found many people had gathered who were afflicted with various illnesses. Straightway, only by drinking the water or pouring it over their afflicted bodies, they were delivered from whatever ailment possessed them. The Greek father, observing all these wonders, asked certain of the people what name they were invoking while drinking or pouring the water over themselves that they should find healing. They said to him, "We utter the name of the Father and of the Son and of the Holy Spirit, one in essence, and the chief commander Michael, the slave of the Trinity." As he heard this, without hesitation, he believed with all his heart. 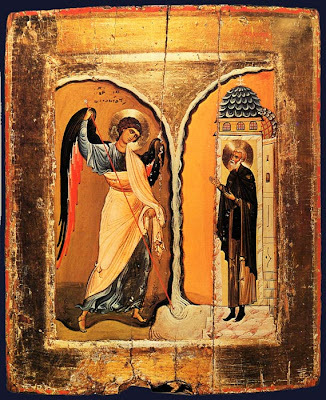 Thus, entreating the God Who is praised in the Holy Trinity and His Archangel Michael, he took up that holy water with faith and gave it to his daughter to drink. Immediately, O the wonder! not only was the girl delivered from the bond of speechlessness, but both father and daughter were loosed from the bond of disbelief. They began in uplifted voices to offer thanksgiving and praise to the true God and to magnify His servant Michael. What happened after this? The Greek nobleman and his daughter, and all those with them, were baptized and became Christians; in addition, the nobleman built a costly temple. He also erected at the site of the sanctified waters a beautiful building with vaulted roof, so that he might say with the Prophet David, "0 Lord, I have loved the beauty of Thy house [Ps. 25:7]." Hence, after showing much faith and gratitude for the benefaction he received from the archangel, he returned to his own house, glorifying God not only for the wonderworking which he beheld in his daughter, but more so for his own conversion. After the passage of ten days, the waters collected in abundance. It was about midnight when the godless broke the gates of the blocked-up waters. They chose that late hour to loose the turbulent waters, so as to surprise Archippos and plunge him into despair when both he and that holy place would be swept away and submerged in the destruction. The impious stood to the left of the church awaiting the outcome. Archippos heard theclamor of the people and the roaring of the approaching waters. With greater fervency, he gave himself over to prayer, reciting the words of the Prophet David, "The rivers have lifted up, 0 Lord, the rivers have lifted up their voices. The rivers will lift up their waves, at the voices of many waters. Wonderful are the surgings of the sea, wonderful on high is the Lord. Holiness becometh Thy house, 0 Lord, unto length of days [Ps. 92:4-7]." Thus did the saint pray, and a divine vision was made manifest. He heard a voice descending from out of the heavens and calling him by name, "Archippos." He was unable to gaze long at the vision of the archangel, and fell on his face to the ground. Then the one speaking said, "Rise and stand on thy feet and come here outside in order to behold the invincible might of God." Regaining courage then from the voice, he exited and beheld a fiery column which went from earth to heaven. He heard a voice from thence telling him to stand to the left side and not to fear. Then the archangel raised his right hand and made the sign of the Cross upon the rock, the one above the church, saying, "Up to this point is thy flux." Then, with what appeared as a javelin in his hand, he struck the place mightily and sundered the rock from the top to the bottom. 0 Thy power, Christ God! We cry with the Prophet David, "The waters saw Thee, 0 God, the waters saw Thee and were afraid; the abysses were troubled. Great was the resounding sound of the waters" [Ps. 76:15, 16]. The waters then halted and stood still as a wall. 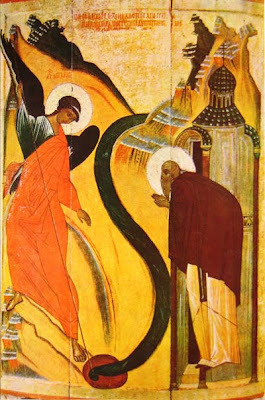 The archangel, again, made the sign of the Cross, and said, "Funnel the waters here." A great earthquake occurred and instilled fear. The waters of the rivers forthwith poured down into that deep ravine. Thus, the archangel subdued the raging flow and the thundering of the river. This phenomenon may be seen to this day. The rivers pour into the funnel in the rock which lies above the church, toward the bema (pulpit). Thus this place, formerly called Colossae, from then was named "Chonae", a Greek word signifying the funneling of the rivers in that place. Archippos, through the assistance of the Archangel Michael, was delivered from a bitter death. With a loud and clear voice he praised and glorified God, and also greatly magnified His minister, the Archangel Michael. Archippos continued living a God-pleasing life in that sacred precinct for seventy years. He was then laid to rest from the labor of his virtues and hastened to his beloved Christ rejoicing, even as the good cultivator sows with godly tears that he might reap the fruits of his toils in the joy of everlasting life. Note: There is an encomium in Greek, "In Colossae of Phrygia, there took place a wondrous event by the all-glorious chief commander Michael...," which is extant in the Athonite monasteries of Great Lavra and Iveron. Having been translated into simpler Greek, it is contained in New Treasure, by Hierodeacon George Sougdoures which was taken and used in the Greek account found in the The Great Synaxaristes. The shrine was a domed building lavishly decorated with marble and gold mosaics. It was renowned throughout the late medieval world and attracted pilgrims from all over Europe and the Middle East. Unfortunately, sharing the fate of all of the churches of Asia Minor, it was looted and destroyed by Islamic armies in the 12th century. Today thousands of glass tesserai are scattered across the field that marks the site of the church. 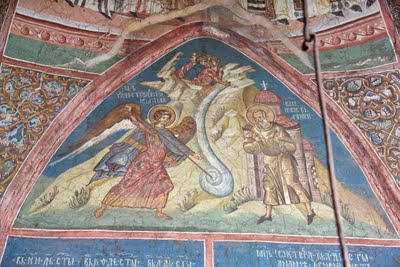 In the 12th century there was a popular revival of veneration of the Archangel Michael that reached the Imperial Court. The Emperor Isaac Komnenos poured enormous sums of gold into embellishing a shrine of the Archangel Michael which stood north of Constantinople on the Bosporus. Rare marble and bronze fittings were taken from other buildings for the church. New splendid jeweled and enameled icons were commissioned by Isaac from Byzantine goldsmiths. Rare ancient images were moved to the church by Imperial decree. All this was lost just a few years later in the sack of the Constantinople by the Fourth Crusade. Perhaps two of Issac's icons of the Archangel survive today in the Treasury of St. Mark's in Venice - loot from the Imperial City. Michael, Prince of the armies of heaven, thou didst overshadow the Church like a cloud raining waters of immortality. Thou didst preserve it as another ark and turn rivers aside with thy spear, to the glory of the Faith and the rejoicing of the faithful. O Michael, who standest altogether radiant before the Trinity together with all the heavenly Hosts, and with them dost cry aloud the song inspired of God: As thou dost pass throughout the earth by God's command and art made wondrous with exceedingly great marvels, cease not to intercede for us all. He can be anywhere swiftly.